Layered chocolate and Baileys cream paired with crumbled Oreo cookies. These parfaits are the perfect weekend retreat! Using a food processor (or zip lock bag + rolling pin or meat mallet), crush the Oreo cookies into crumbles, then set aside. Place chopped semi-sweet chocolate in a small bowl. Heat milk until steaming, then pour over chocolate. Let sit for 2-3 minutes, then stir. If any chunks of chocolate remain, heat in the microwave for 30-second intervals until all the chocolate has melted. Mixture will be very liquid, like chocolate milk. Set aside and let cool to room temperature. Using a stand mixer (or hand mixer + large bowl), add in chilled heavy cream, Baileys, and powdered sugar and beat on high until stiff peaks form, about 5-7 minutes. Divide cream mixture in half. The first half of the whipped cream will be left alone and is ready to use in the parfait. The second half will be mixed with the chocolate. When ready, slowly add the chocolate mixture over this half of the whipped cream, gently (yet thoroughly) folding them together until completely mixed. To assemble the parfaits: Using a pastry bag (or just a spoon), add layers of the cream and crushed cookies as you see fit. 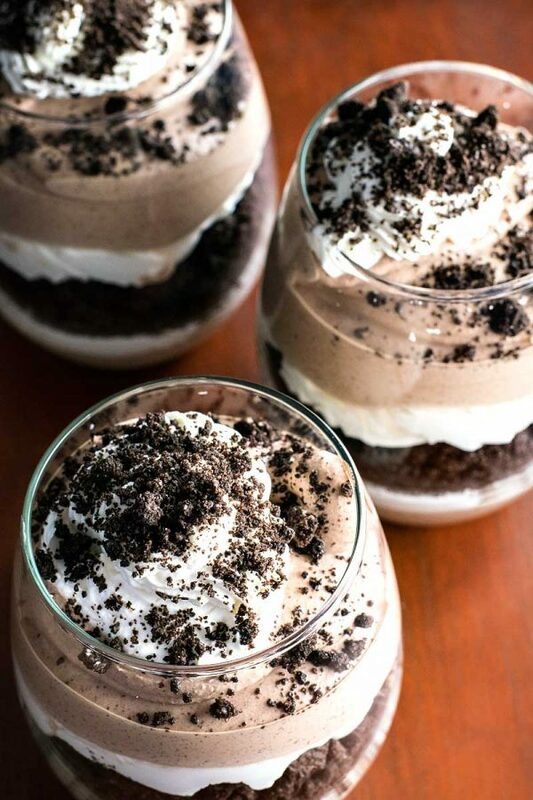 To do this as pictured, I layered chocolate, then cream, then cookies, then cream again, then chocolate again, then cream again, and finally finish with any remaining cookie crumbles on top. Parfaits can be served immediately. If you’d like the chocolate layer to be firmer, chill parfaits for 2-3 hours before serving.